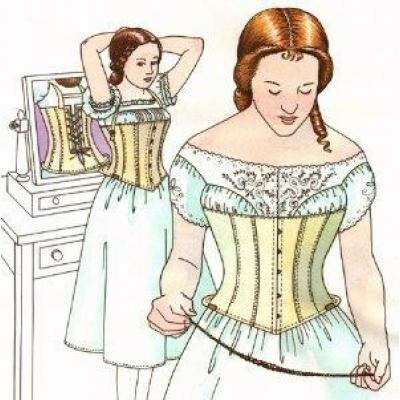 Past Patterns first published this pattern in 1985 and named it the 1863 Bust Supporting Corset. After researching patent records, they corrected the historical notes and revised and updated the pattern and the pattern sizes. The corset can be made without the straps to wear under an off the shoulder gown. This pattern is multi-sized 8 through 26 in a B, C and D cup. Sizes 8 through 12 require 1-5/8 Yds. ; sizes 14 through 16 require 1-3/4 Yds. and sizes 18 through 26 require 2 Yds. of 45 inch wide fabric. The fabric from which the original is made is an undyed light weight cotton drill. The chemise illustrated is Past Patterns #707. Wear this with Past Patterns' #712 Hoop Skirt.